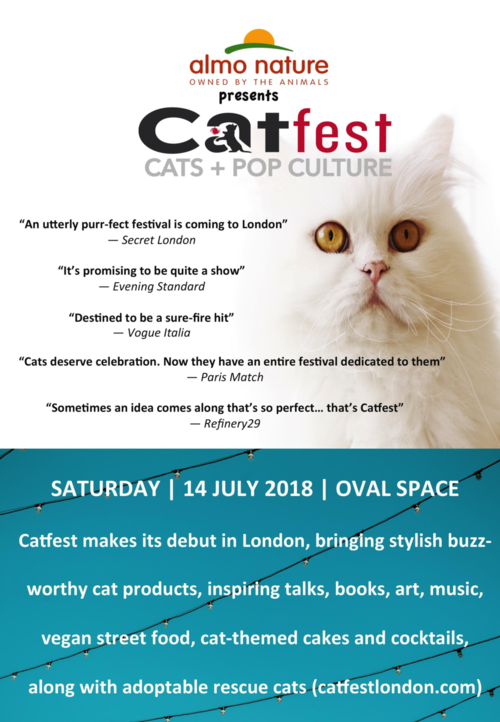 Almo Nature presents the UK’s first and only cat festival showcasing cat-related products, inspiring talks from animal experts, including star of BBC’s Big Cats About The House show Giles Clark and New York Times bestselling writers Jeffrey Moussaieff Masson and Gwen Cooper, while helping cats in need. Cat lovers can come in fancy dress, meet Instagram feline superstars, browse through the pop-up Kitty Lit & Art Corner with finely curated cat art and books. Enjoy vegan street food and kitty-shaped cakes and cat-themed cocktails from the vintage airstream Pussycat Lounge to the sounds of Sixties and indie classics from the Beatles and the Stones to the Libertines and the Stone Roses; play cat bingo or have a tarot-card reading from Harper’s Bazaar’s go-to London psychic Jacqui Cosham aka Mystic Mog. Fall in love with adoptable rescue cats at the Meow Parlour inside the Pickle Factory. Catfest will donate £2 from every ticket to ACE Dog, Cat & Kitten Rescue and TICA (adoptions and home-checks will be facilitated by our beneficiary charities), additional funds from raffle and competition will go Erham to help Moroccan street cats. For every adoption, Almo Nature will give a month’s supply of free food; plus festival goers will get swag bags for their cats at home. Almo Nature, the pioneer of human-grade pet food, is the first-ever brand “owned by the animals”, which means all the profits support cats and dogs in European shelters and wildlife projects.